Technological Issues Relevant to Policy (6 Mb). One of Ted's main points (and I agree with him on that completely) is that whatever the politics of the issue, decisions should be based on accurate information. 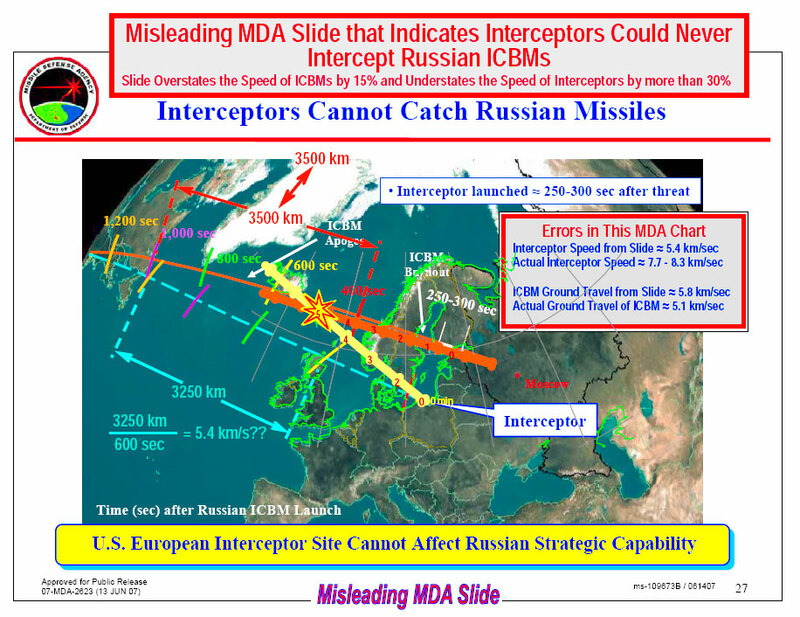 In this case, as he shows, the Missile Defense Agency claim that interceptors in Poland cannot reach Russian missiles is simply wrong. It is debatable whether this would make any difference, but this kind of misleading statements made by MDA certainly do not help the political situation. One slight flaw (a rather huge one). At five minutes (when the ABM is leaving it's silo) the Russian ICBM is out over the GUIK gap. NO WAY is that ABM going to be able to make up that kind of lead. That so-called "intercept" at five minutes implies they both left their respective silos simultainiously. Secondly they don't accelerate instantainiously. The ICBM has a significant velocity built up by the time the ABM even leaves it's silo. Thirdly the velocity Ted claims for the US ABMs is greater than that needed to achieve orbit. Does he really believe they'd launch KKVs that would take an indefinite amount of time to return to earth and could land almost anywhere? Sometimes he has a point and then he comes up with a howler like this graphic and sends his credibility sailing out the window. Why are Russian ICBM's so slow? American Minuteman travels 7km/s. Why Mr. Postol compares "actual [US] interceptor speed" [~7.7 - 8.3 km/sec] and "actual ground travel of [russian] ICBM" [~5.1 km/sec]? How such it is possible? From the point of view of mechanics it is absolutely different parameters. Besides "actual ground travel" for "Topol"-class ICBM is more, than ~5.1 km/s. I completely agree Pavel. Especially as Postol notes that current administration policy is for apparently unlimited ABM development and deployment. How are the Russians supposed to take this sort of threatening and misleading information? Especially now as Putin's rather ingenious proposal has been essentially rebuffed. I see no other alternative for Russia than to put more money into ABM defeating warheads and possibly new IRBM's to maintain the strategic balance if current US plans proceed. If the radar to be deployed on Czech soil were to have the same capacity as the one in Vardö (do we actually know that it does/does not? ), what additional intelligence could it provide that satellites do not? I mean recent news about regular Russian bombers flights with 'regular' weapons :-), as well as older talks about reincarnation of MRBMs in Europe & so on. Sorry for the delay with posting the comments. Also, before trying to criticize Ted's analysis, keep in mind that there've been a number of people who tried to do that. No one succeeded so far. "Also, before trying to criticize Ted's analysis, keep in mind that there've been a number of people who tried to do that. No one succeeded so far." Well I for one would be interested in hearing how he thinks an ABM is going to chase down an ICBM that has a five minute (in a perfect world) head start. Simply repeating "because it will" doesn't cut it in my book. Take a look at the video (the link is in my previous comment) - it shows how it may happen. "Take a look at the video (the link is in my previous comment) - it shows how it may happen." That's actually pretty interesting. However it still begs the obvious question: if they were meant to be used against Russian ICBMs why not just stick them in Maine or something and save a lot of $$$, hassle, and so forth? The second question of course is "so what?" Even if all ten were used against Russian missiles that's a drop in the bucket considering Russia has hundreds of ICBMs. Thirdly if Russia wanted to hit the East Coast they could easily do it with SLBMs and bypass those ABMs completely. This whole thing is a hurricane in a teacup as those ABMs wouldn't have any notable effect on a Russian strike even in the very best case. The point there is not necessarily that those interceptors would be used aginst Russian missiles (they would be useless against them anyway). I believe it is that MDA should not be allowed to make misleading (to put it mildly) claims. "The point there is not necessarily that those interceptors would be used aginst Russian missiles (they would be useless against them anyway)." So I take it in your opinion Postol is wrong on this one? As for MDA making misleading comments when did it become expected that a country has to reveal the specific capability of it's military hardware? I realize the US media feels it's entitled to anything and everything but I figured most rational individuals would realize that ALL militaries keep secrets when it comes to the capabilities of it's weapons. I'm pretty sure if I tried to get all the specifics of the S-400 from a Russian engineer I'd either be arrested or shot. (Or arrested AND shot I suppose :^) ) Bottom line is MDA doesn't HAVE to tell us all the details and indeed it would be derelict in it's duties to do so. As for Postol he's definitely a man with an agenda and has never let something as trivial as national security keep him from trying to be the center of attention. First he says ABMs are useless and now he says MDA is UNDERSTATING their capability. So which is it Ted? If people at MDA think that they can fool anyone by understating capability of their systems, they are dead wrong. It's like closing your eyes and hoping that no one can see you in the dark. In any event, revealing detailed information about those systems is not going to make a bit of difference - these things are not very hard to figure out. "(they would be useless against them anyway)"
What's the speed of the SS-27? It's not a question of speed. Hitting a warhead with a missile is not that big of a deal - it was done back in the 1960s. Finding the warhead among decoys is a different matter. There is no way defense could do it if it is dealing with a determined attacker. Here read this,It's old but still. Especially "A poke in the eye" and "Fingerprinting" part. The radar has already been stationed near the Kamchatka peninsula. Americans will be able to tell apart from decoys and real warhead(s) in the future,It's only a matter of time.really,and that worries me a lot. Will the radar in the Czech Republic also be able to "watch" tests between Plesetsk and Kamchatka as does Vardo? "If people at MDA think that they can fool anyone by understating capability of their systems, they are dead wrong. It's like closing your eyes and hoping that no one can see you in the dark. In any event, revealing detailed information about those systems is not going to make a bit of difference - these things are not very hard to figure out." Unless you've got specific information on propellant formulations, burn profiles, vehicle weights, component weights, fuel fractions, and so on it's no more than guesswork. SICBM (Midgetman), KEI, and GBI are all roughly the same size and weight but their flight performance is (will be/ was) radically different. In fact Midgetman appears to have higher acceleration off the pad than GBI. On "Fingerprinting": No, the radar won't be able to see any of the launches from Russian test sites. Which thesis? And what is manipulated? I’m going to work under the assumption that Ted Postol’s work is fact. (I certainly have no reason not to assume so) Based on his assumptions, is it not logical the solution to the impasse between Russia and the US, on the proposed GBI system in Poland and the Czech Republic, is to limit the interceptor missiles? Again assuming the European US ABM system could indeed intercept Russian ICBMs launched against the US, limiting the number of interceptors would allow the US to target any perceived Iranian ICBM threat and yet not impact the numerous and far more sophisticated Russian fleet. Twenty years in the future, as the Iranian “threat” grows, so could the number of interceptors by mutual consent. I’m not looking for a formal treaty here, just a “gentleman’s agreement” similar to the understandings on tactical nuclear weapons at sea.